The salad arrived in an enormous bowl. I was happy to see that it looked just as good as the photograph on the menu. 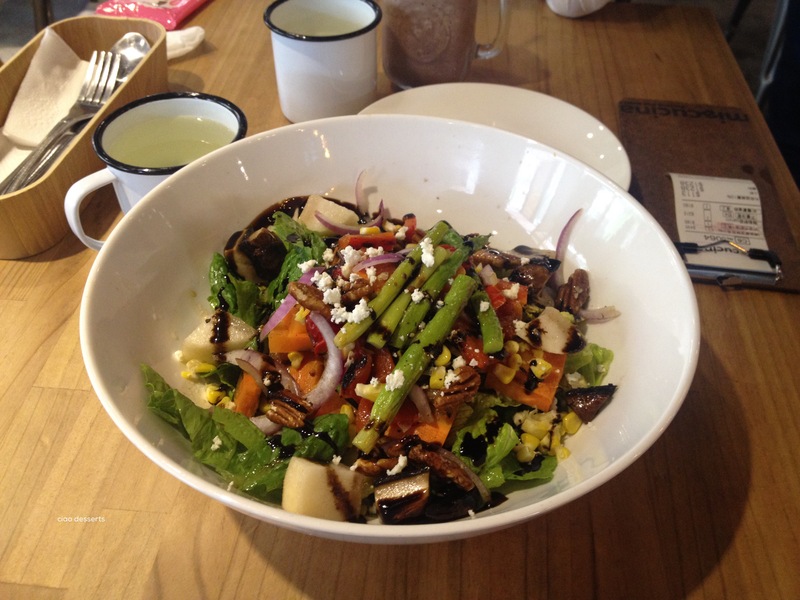 In addition to romaine lettuce leaves, the salad had grilled corn, asparagus, red bell pepper, carrots, portobello mushrooms, eggplant, red onions, pears, caramelized pecans, and get cheese. It was dressed with both balsamic glaze and balsamic dressing. There was a good balance of hard and soft vegetables, and the flavors of the vegetables were well enhanced by the balsamic glaze and dressing. My one bugbear was the inclusion of Asian pears, which I didn’t think really went with the overall combination of ingredients. They weren’t bad, but just a little strange in this bowl. Bartlett pears are not as widely available in Taiwan, so I’m guessing why the Asian pears were there. I also really liked how they cooked the carrots (I think they were lightly blanched then grilled) By doing so, they matched the texture of the rest of the salad. (Something about raw carrots mixed in with grilled veggies really bug me, but I can’t exactly put my finger on why) The other ingredient that added sparkle to the salad was the toasted pecans. I had forgotten how much I liked pecans, until we were reacquainted this afternoon. Speaking of desserts, Mia Cucina has a dazzling array of options. They are home to the “cruffin” (combination of muffin and croissant) . After much deliberation, I decided on carrot cake. It was a lovely three layer cake, each layer had a generous, but not overwhelming portion of cream cheese frosting. The frosting was just the right balance of sweet and tanginess, the cake had a moist, cinnamon-y flavored crumb, and was crowded with shredded carrots, raisins and walnuts. Delicious. The food at Mia Cucina can be described as food that both comforts and nourishes you. The have a good selection of healthy and decadent options, and you can easily mix and match, or share so you can taste several different items. One part that I took away from the experience is how well they adapted their salads to suit the surroundings and Taiwanese palate. A lot of their ingredients are grilled (several of the Taiwanese people I know do not like to eat raw vegetables) and most of the ingredients used are are easily found in Taiwanese grocery stores. Sometimes I try to replicate a more “western” salad at home, and I end up spending too much money on imported ingredients, so I am always inspired by salad combinations that use ingredients that can be bought locally. The restaurant was crowded, even for a weekday, so it was impossible to get a clear shot of the workstation where the salads were being made. But from what I could see from my chair, each ingredient is prepared ahead of time, and stored in a specific box. After being ordered, different combinations were assembled into large bowls, and then drizzled with dressing. This entry was posted in Uncategorized and tagged carrot cake, Comfort Food, Italian food, salad. Bookmark the permalink.